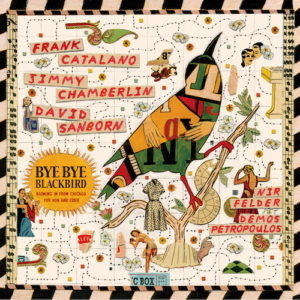 Saxophonist Frank Catalano pays tribute to fellow Chicagoan saxophonists Von Freeman and Eddie Harris on this new set of standards, old and new. Alto sax man David Sanborn trades licks on two of the six tracks, the title cut and the soul-jazz classic “Sugar,” and the two come something close to magic. Catalano’s group tours with Smashing Pumpkins, and Catalano himself has maintained a close friendship with Pumpkins’ drummer Jimmy Chamberlain, who infuses his own take into this music. Blues and funk often underlay Catalano’s Chicago-based horn sound, and Demos Petropoulos on Hammond B3 pushes the sound in that direction more than most jazzmen would. The music on this Bye Bye Blackbird—as most good music does—draws from a variety of genres, a habit that stands Catalano in good stead when he plays Etta James (“At Last”) or Miles Davis (“All Blues”) or when he sits in with Beyoncé and John Legend. When it comes to playing through pain, Chicago tenor saxophonist Frank Catalano has more experience than most of his colleagues. Eighteen years ago, he severed the middle finger of his right hand while fixing his car, enduring surgery to reattach it and months of therapy to regain the ability to play his horn. To this day, the digit sometimes swells up like a balloon. Two years ago, he was in auto accident that tore a ligament and cartilage in a shoulder and left his neck “hanging out like a Slinky,” he recalls. Months of therapy have ensued, and it wasn’t until last year that he started playing hard again, though he has had to cancel dozens of important engagements along the way. So when he takes the stage of Andy’s Jazz Club on Friday and Saturday nights, Catalano, one of the mightiest of this city’s under-40 tenor men, will be ready for battle, he says. “At this point, I’m just excited to be in one piece,” Catalano says. Saxophonists are collectors; it’s an occupational hazard. They amass boxes of reeds to find one that works perfectly; their closets bulge with the secondary saxes, clarinets and flutes they are expected to play in bands and orchestras. 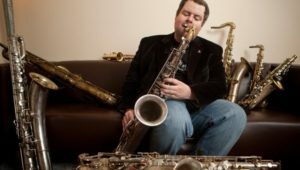 And if the home of a professional saxophonist often resembles a small-town music shop of decades past, with perhaps a dozen instruments, Frank Catalano’s home is more like a saxophone Wal-Mart. Mr. Catalano’s 60 or so instruments, 45 of which sprawl across three floors of his house in Bucktown, include more than 20 models of his main horn, the tenor sax, and several of the big baritone saxes popular in rock ’n’ roll. He also has more than a dozen soprano saxes — many of them the lovely little curved ones in vogue until the 1950s — and some flutes. 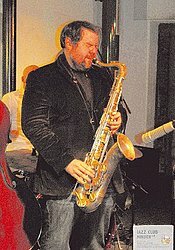 He owns two dozen alto saxes alone — and he does not even play alto, at least not in public. 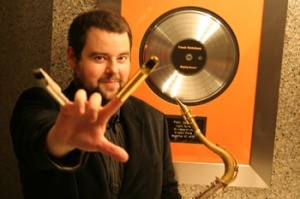 Precocious Chicago-born sax player Frank Catalano has performed with Miles Davis, Randy Brecker, Charles Earland, Elvin Jones, Stan Getz, Betty Carter, Von Freeman, Tito Puente, Tony Bennett, Les Claypool and Louis Bellson… and he did so while still in high school! By age eighteen Catalano had his first record contract, with Chicago’s Delmark Records. This led to a string of critically acclaimed recordings. Catalano has been heard by millions of people all over the world, thanks in part to three Grammy-winning and eleven Grammy-nominated recordings with artists such as Jennifer Lopez, Destiny’s Child, and John Legend. More recently, he has performed live on the Oprah Winfrey TV show with singer/composer Seal, and had two successful albums: Bang!, on the Savoy label, which debuted at #12 on the Billboard Jazz Charts, and his previous CD, Mighty Burner, which was on the Billboard Charts for twenty straight weeks. 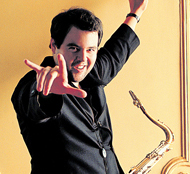 Tenor saxophonist Frank Catalano has led a charmed life, especially for a modern-day jazz musician. Jazz doesn’t mint as many successful stars as it used to, but Catalano makes the career path look easy. As a Chicago teenager, he caught the eye of the prominent saxophonist Von Freeman, who became his mentor. He played with Miles Davis and Tony Bennett and signed his first record contract at age 17. Shortly thereafter, he placed two albums on the Billboard jazz charts, Mighty Burner and Bang! Catalono braucht keine Anlaufzeit. Mit noch jugendlicher Kraft beginnt der 33-Jährige gleich auf hohem Energielevel, bläst ein paar groovende Funk-Phrasen, kurze R&B-Licks, die von der Band weitergeführt werden, und widmet sich dann fast ausufernden Sololinien. Man könnte fast von Riff-Jazz sprechen, so einprägsam sind seine Phrasen. Whenever we go to events, we carefully choose seats that easily allow quick exit in case Alex decides he’s had enough. At the concert we were able to find aisle seats near the door in the first row of an upper tier that provided a good view of the stage. The V.U. Faculty Jazz Trio, consisting of talented musicians who play piano, bass, and drums, performed that night. In addition, special guest performer Frank Catalano accompanied them on saxophone. While Alex seemed to enjoy all of the songs they performed, he especially liked Frank Catalano’s original composition “God Made It Beautiful.” [Click herefor an excerpt of this song Alex enjoyed so much.] During the concert, which lasted over an hour with an encore, Alex displayed improvements that we have noticed in the past several months. First, despite being in an audience of about two hundred people, he did not seem bothered at all by the crowd or by the noise. Also, he has learned appropriate social behavior, namely being quiet during the concert, yet applauding at the proper times. Unlike many of the college students there, who are about the same age as Alex, he didn’t keep checking a cell phone for messages or texting people during the show. Even if he had a cell phone, I doubt Alex would want to be distracted while he was engaged in something as enjoyable as a concert. More evidence of his progress lies in his ability to keep time by tapping his hand on his leg. Prior to beginning music therapy nearly a year ago, he did not have a good sense of rhythm. Now he can move in time with the beat. 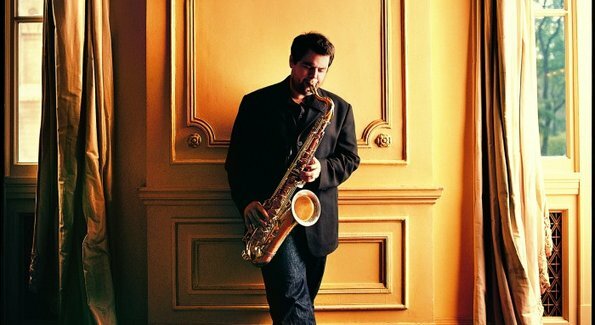 Chicago’s Frank Catalano emerged as a teenage saxophonist in the ’90s amid great fanfare, and over the past decade has proven himself one of the few teenage prodigies to live up to the hype, earning an increased critical following and even a Grammy nod for his edgy bebop. His success is all the more remarkable considering that as a teenager he severed his middle finger in a mechanical accident, an injury that forced him to alter his technique. Tonight Catalano returns to the Jazz Estate. 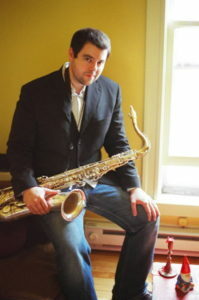 Chicago sax player Frank Catalano tears into his leads with fluid, funky aggression, and can keep that boldness up through 10-minutes-plus live workouts on standards and his original compositions. This probably explains why he’s been able to hold down gigs with both Santana and (yep) Ministry, but it also means he’s best suited to push his way to the front of the mix and stay there. At least, that’s how things tend to work out on studio albums like 2008’s Bang! and live albums like 2001’s Live At The Green Mill. His set at Magnus should have some extra punch courtesy of John Sparrow, a Milwaukee drummer who plays in the current incarnation of Violent Femmes.